Personally, I believe toolbars should be banned from all browser, this includes Mozilla Firefox, Google Chrome, Apple Safari and Microsoft Internet Explorer (Spartan). I do not see a need for it, this include Norton antivirus toolbar, Kaspersky Toolbar, McAfee Toolbar and other similar security toolbar. 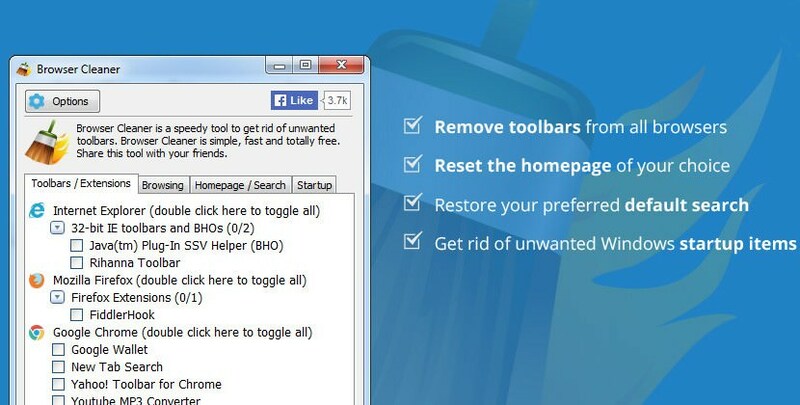 You’ve probably seen your parent’s browser, and here are 5 free software to remove unwanted toolbars from their browsers. Yesterday was a great day, Avast officially launched their Avast Browser Cleanup, basically it is a tool that automatically scan and removes unwanted web browser extension and add-on such as toolbars. If you want to verify your own browsers or get rid of an unwanted toolbar, download the stand-alone tool at Avast. This is a must have tool for those visiting their parents, or a standard feature build into every single browser. Now you can remove those pesky toolbars that get installed when you download free software with avast! Browser Cleanup. It will even restore you browser settings and default search provider. The results can be seen below, Microsoft Internet Explorer has the highest uninstall rate among all the browser, followed by Mozilla Firefox. It appears Google Chrome and Apple Safari has the least toolbar installed, possibly because their primary users are more tech savvy. Works great on Microsoft’s Windows 10 and Apple’s macOS. Get rid of unneeded add-ons or toolbars and take full control of all your browsers with this program’s easy-to-use ‘Central Command’ interface. 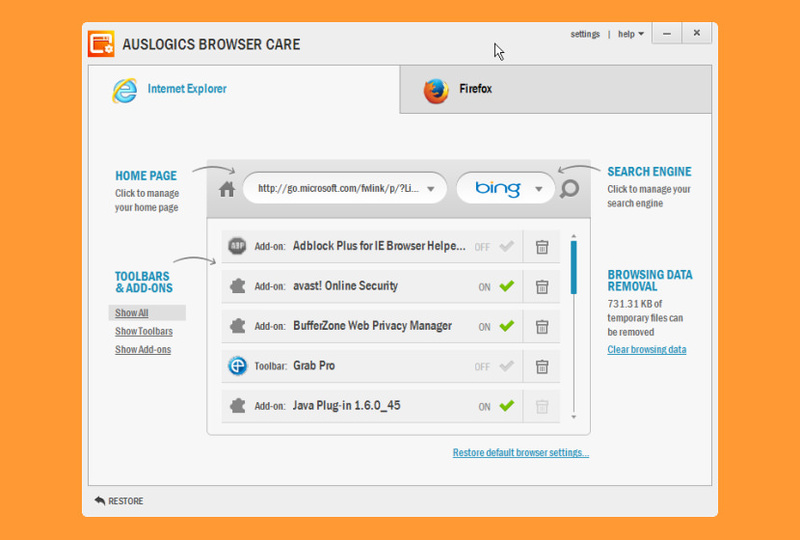 Auslogics Browser Care automatically detects popular browsers installed on your computer and provides an easy way to manage each of them, removing or disabling add-ons or toolbars, clearing cache, setting home page and search engine of choice – all from one convenient interface. 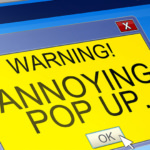 This application will scan and remove software that may cause problems with Chrome, such as crashes, unusual startup pages or toolbars, unexpected ads you can’t get rid of, or otherwise changing your browsing experience. The application does not require installation and starts looking for suspicious programs as soon as you launch it. The number of findings are displayed within a small window, along with an option to remove them all, but their names are not revealed, so as to prevent name modifications that might cause Chrome Cleanup Tool not to work as it should. 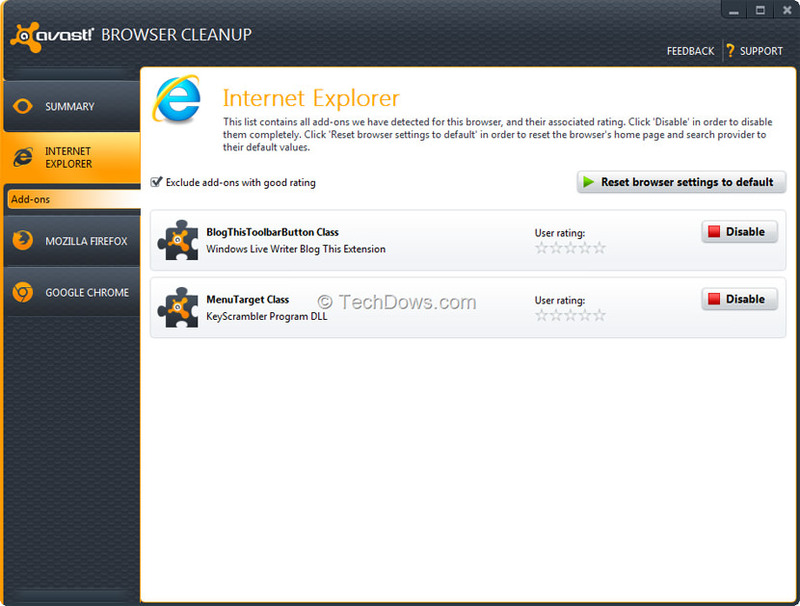 Fast Browser Cleaner is a utility to clean unwanted toolbar, addons, extensions. It helps you to clean cookies, history and temporary files which are stored by websites you visited and occupy a lot of disk space. 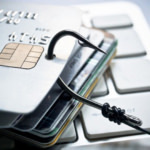 You can also remove unprotected passwords and credit card information stored by the browser which you used to login to some website or make payment. 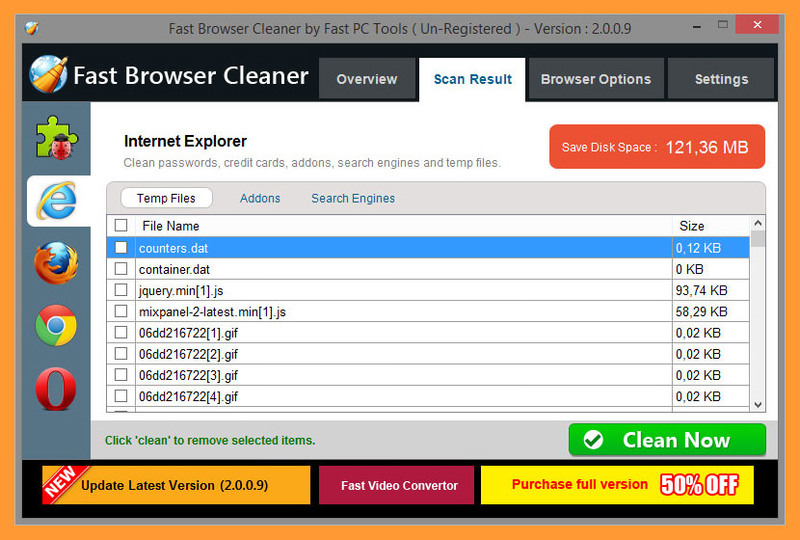 Fast Browser Cleaner is a simple and user-friendly application and easy to understand software. It offering you scan and delete your browser junk and easily erase adware, cookies, temporary files or websites history from your IE, Chrome, Firefox, Opera. Manage Addons – You can remove unwanted toolbar, addons, extensions. Remove Credit Card Information – Remove Credit Card details which stored by browser. Remove Adware – You can clean adware like MyStartSearch, Wazam, HealthAlert, ReleventKnowledge, SweetIm, Babylon, Most of the toolbars of conduit, GameDesktop etc. Remove Passwords – Remove unprotected login details(user name , passwords etc) stored in browser. Thank you very much for sharing this. I have some annoying toolbars are installed automatically with some programs and I really hate them. Everyone hates toolbar, I think there need to be a browser that prevents the installation of toolbars, any toolbars be it Norton Toolbars. 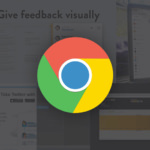 How do you uninstall toolbars on google chrome? Let me hear you sing your favorite Usher song! This page contains step by step instructions on how to remove Certified Toolbar and search.certified-toolbar.com from your browser. How to remove the conduit toolbar?